Kitchen cabinets are a major investment, so it’s helpful to know what you want. About 40-50 percent of the cost of a kitchen is the kitchen cabinets, so it is important to choose wisely. When choosing the right kitchen cabinets, there are a number of questions to ask yourself concerning both form and function. The last thing you want to realize is that you don’t have enough space when the contractor leaves and you have nowhere to put your waffle maker and omelet pan. You also don’t want to re-enact the Seinfeld episode where Jerry and Elaine find the kitchen cabinets obstructing their view of each other and can’t even carry on a conversation after Jerry had his kitchen remodeled. You want to strike a balance between comfortably storing your cookware and being able to entertain guests without having to shout. First, think about your lifestyle and how you will use the kitchen. Before you start looking at door handles, think about the big picture: What will make you get frustrated? What will make you enjoy your kitchen? Or, does your kitchen simply need a facelift? If you are re-modeling your kitchen cabinets, ask yourself why you want to change it. Do you need a stepping stool to access dishes? Is it because you have empty space that you would like to put to good use? Do you find that you are storing items on the counter that you would like to store in cabinets to allow you more space for cooking or other activities? Quantify this as much as you can. Our designers will work with you to create something that will accommodate your needs. In terms of aesthetics, make sure the cabinets you choose coordinate with the rest of the kitchen design. Eclectic looks done right can be beautiful, but you don’t want visitors to be confused when they walk into your kitchen. Also, consider price. Try to choose from aesthetic appeal, durability, or quality construction for your focus. Unless money is unlimited, you want to put your money toward what is most important to you. Take out a piece of paper and write down what you’re looking for. Just like buying a house, you want to put together your cabinet budget first, before you get your heart set on anything. We can help you create a beautiful kitchen at any price point; however, by deciding how much you want to spend we can make sure you end up with the kitchen you love without breaking the bank. Keep in mind that a typical kitchen has 25 to 30 linear feet of cabinets. The price depends on material, construction, and level of customization. Hardware comes in a wide variety of styles and can make an antique cabinet look fresh and retro. More elaborate hardware can enhance the time period the rest of the kitchen evokes. Framed kitchen cabinets are popular in traditional kitchens and are also referred to as American style. Framed kitchen cabinets have a five-sided box and a sixth side to complete the cube with a window cut out of it, resembling a picture frame. This sixth side is referred to as a ‘face frame.’ The cabinet door attaches to the face frame. The drawback is that the interior of the cabinet is harder to access. One benefit is that the face frame makes the cabinet sturdier. You also have more options for door overlay (how much of the frame the door covers). Full-overlay means the doors and drawers completely cover the face frame. Partial overlay, standard, or traditional overlay means the doors and drawers partially cover the frame. Full inset or inset means the doors and drawers are inside the face frame opening. 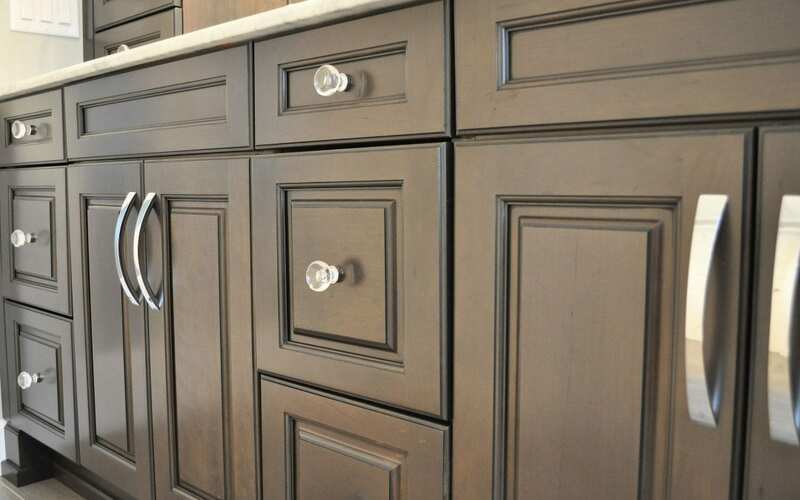 Also called European-style, these cabinets lack a face frame. Instead, the door attaches directly to the side of the cabinet (In other words, only full overlay doors are used.). These kitchen cabinets are often used in contemporary kitchens. Their benefit is that they allow easier access to the cabinet interior. Their downside is that they aren’t as sturdy as framed cabinets. However, higher-quality frameless cabinets compensate for this by using a denser or thicker material. There are three levels of customization when it comes to kitchen cabinets. Stock cabinets are the most cost-effective option. Premade in standard sizes (typically 3-inch increments), their quality varies from poor construction to high-end solid wood. So, keep an open mind but also do your research. Stock cabinets come in a limited variety; however, if you are flexible with your requirements, a designer can usually use creative problem solving to both utilize stock cabinetry and make an amazing design that fits your vision. Also consider implemented molding into your kitchen design. This makes stock cabinets look like they are custom made. Semicustom cabinets are pre-made like stock, but with a wider variety of options. The range of styles will not be as broad custom cabinets, but they cost less. Custom cabinets are the more expensive route and take awhile to make. So if you are planning a remodel or building a new home, keep in mind that you will want to order cabinets right away to have them ready when you need them. Also, if you’re not planning on reselling your house, make sure it’s something that would appeal to a variety of people. Note that custom doesn’t equal quality and stock doesn’t equal poor quality. It is important to have a warranty. One to five years is common. Since kitchen cabinets are expensive, no warranty is a red flag. Watch out for lifetime warranties that are only 10 years. If a manufacturer thinks a cabinet should only last 10 years, that’s also a red flag that it might not be the best quality. Kitchen cabinets come in four basic types and there are also four basic door styles. You can also decide what special features you’d like to add to make your kitchen support your lifestyle. Base cabinets make things easy to reach. Upper cabinets are a good way to add storage. The industry trend in base cabinets is adding drawers to keep things more organized. Accessories are useful but increase the cost by upwards of 20 percent, so think about how you will actually be using your kitchen before you commit to accessories that look good on paper, but you might not actually need or use. If you already have cabinets but want to update your kitchen or just want a change, painting or staining your kitchen cabinets is an economical way to dramatically transform the room. Another makeover option is replacing the doors on the cabinets. However, around 70 percent of the cost of a cabinet is the door, so it would be close to buying new ones. If your cabinets are in good shape but you still want a change, instead of re-doing everything entirely, why not give your kitchen cabinets a facelift instead? It’s cheaper, takes less time, and reduces waste. Kitchen and Bath Unlimited provides both design help and sells and installs kitchen cabinets. For over 30 years, our friendly and personalized service, combined with our attention to detail, have allowed us to turn clients’ dreams into reality. Call us at 269-375-2212 or visit our showroom on Stadium Drive in Kalamazoo. A design specialist is standing by to help you pick out the perfect kitchen cabinets for your renovation project or new home build.